Fig 1. 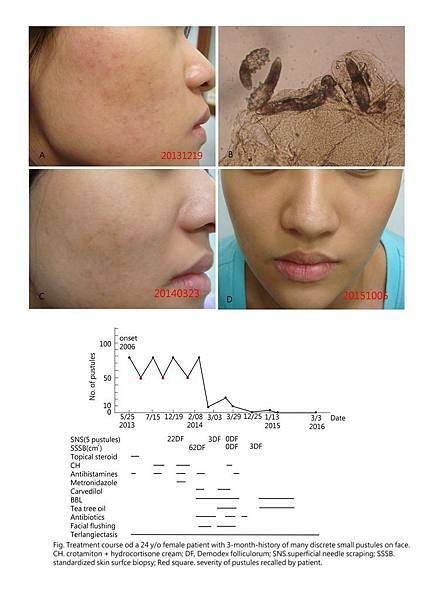 酒遭分類，ETR, erythematotelangiectatic rosacea; PPR, papulopustular rosacea. Int. J. Mol. Sci. 2016, 17(9), 1562. Acta Physiol (Oxf). 2011 Sep; 203(1): 99–116. Crawford GH, Pelle MT, James WD. Rosacea: I. Etiology, pathogenesis, and subtype classification. J Am Acad Dermatol. 2004 Sep;51(3):327-41; quiz 342-4. Gallo RL, et al. Standard classification and pathophysiology of rosacea: The 2017 update by the National Rosacea Society Expert Committee. J Am Acad Dermatol. 2018 Jan;78(1):148-155. M. Schaller et al. Rosacea treatment update: recommendations from theglobal ROSacea COnsensus (ROSCO) panel. 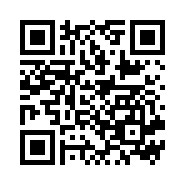 British journal of Dermatology (2017) 176, pp465–471. Woo YR, et al. 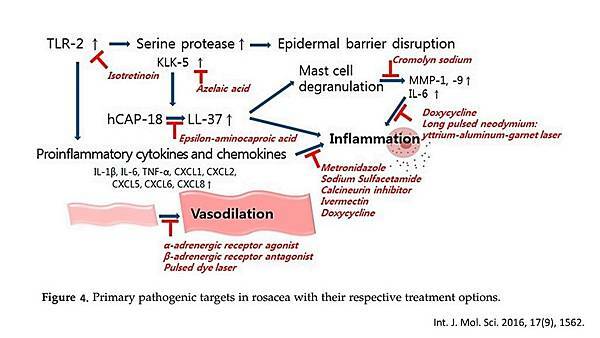 Rosacea: Molecular Mechanisms and Management of a Chronic Cutaneous Inflammatory Condition. Int. J. Mol. Sci. 2016, 17(9), 1562. Forton F, Seys B. Density of Demodex folliculorum in rosacea: a case-control study using standardized skin-surface biopsy. Br J Dermatol. 1993 Jun;128(6):650-9. Taieb A, et al. 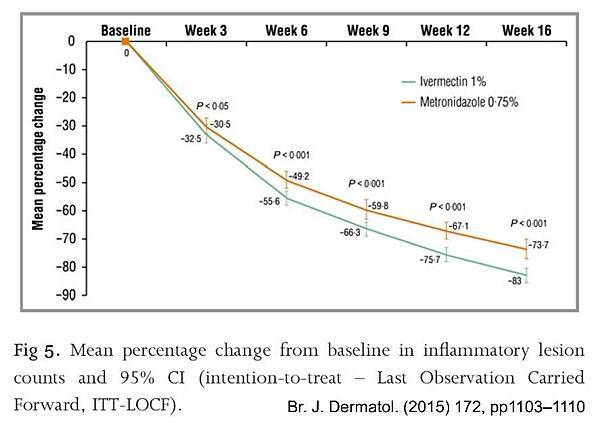 Superiority of ivermectin 1% cream over metronidazole 0·75% cream in treating inflammatory lesions of rosacea: a randomized, investigator-blinded trial. Br J Dermatol. 2015 Apr;172(4):1103-10. Baylie RL, Brayden JE. 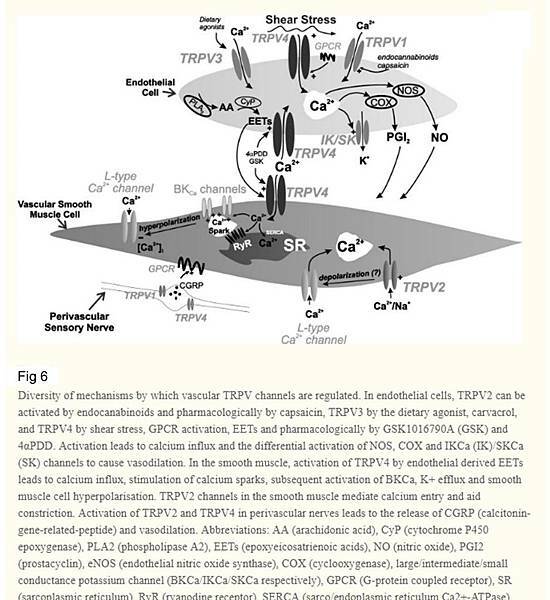 TRPV channels and vascular function. Acta Physiol (Oxf). 2011 Sep; 203(1): 99–116. Del Rosso JQ. Advances in understanding and managing rosacea: part 2: the central role, evaluation, and medical management of diffuse and persistent facial erythema of rosacea. J Clin Aesthet Dermatol. 2012 Mar;5(3):26-36. Mukherjee P, et al. 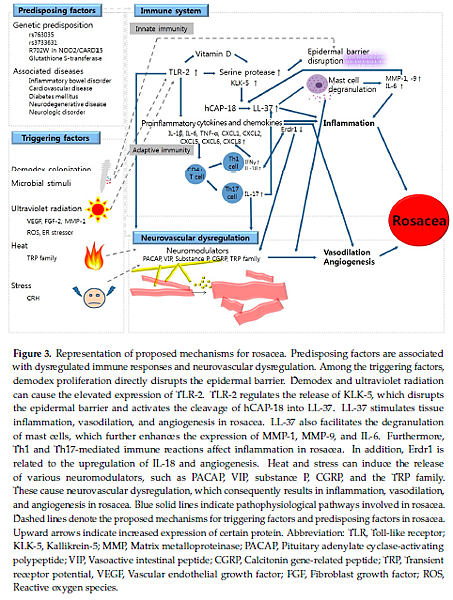 Development of nitric oxide synthase inhibitors for neurodegeneration and neuropathic pain. Chem Soc Rev. 2014 Oct 7;43(19):6814-38. Kellogg DJ, et al. 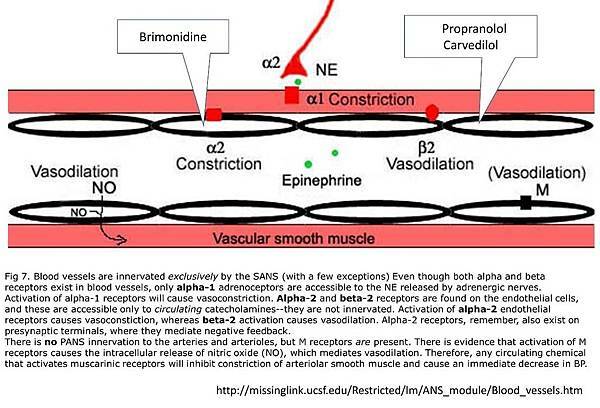 Cutaneous active vasodilation in humans is mediated by cholinergic nerve cotransmission. Circ Res. 1995 Dec;77(6):1222-8. Kellogg DJ. In vivo mechanisms of cutaneous vasodilation and vasoconstriction in humans during thermoregulatory challenges. J Appl Physiol (1985). 2006 May;100(5):1709-18.